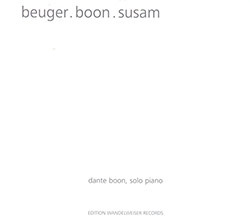 Pianist and composer Dante Boon performs his own work "Years, Numbers", alongside Antoine Beuguer's "Pour Etre Seul(e), Sans Reserve" and Taylan Susam's "Tombeau", and Bueger's "Nov. (piano)", four works of graceful and introspective beauty using minimal approaches to tone, chord, or spaciousness, recorded live at University Of Wisconsin-Whitewater in 2014. 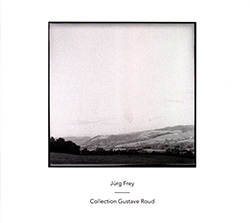 A double CD with five beautiful pieces that engage with the work of the extraordinary French-Swiss poet Gustave Roud, with performers including Dante Boon, Stefan Thut, Andrew McIntosh and Jurg Frey himself, 10 compositions that Frey wrote in the manner that Roud would, roaming with a sketchbook and developing the pieces based on impressions of his surroundings. 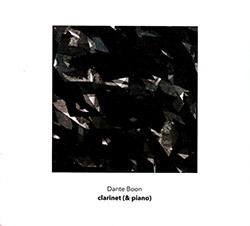 Three beautifully delicate works for Jurg Frey's clarinet, composed by the Amsterdam-based Wandelweiser composer/pianist Dante Boon, who has collaborated with Frey for several years and who accompanies Jurg on two of the pieces. 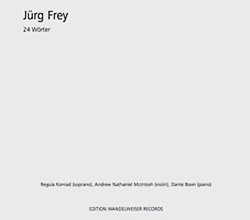 Composer Jurg Frey's "Landscape with Words" presents 27 compositions, 24 of which are based on individual words in orchestration with piano and violin, understated and minimal yet sumptuously lyrical and evocative, using space and tension to illustrate each segment.